In addition to campaigning for specific candidates, aides to Democratic National Committee, the Democratic Congressional Campaign Committee and the Democratic Governors Association confirmed to CNN that Clinton will headline fundraisers for each respective group in 2014. Clinton is also slated to headline one of the most anticipated events of the year in Democratic politics in Iowa: Sen. Tom Harkin's Iowa Steak Fry on September 14. Sen. Harkin’s team announced Monday that Clinton – along with her husband former President Bill Clinton – will headline the fundraiser in the first-in-the-nation caucus state. The steak fry regularly draws big-name, national politicians and is seen as a required stop for any Democrat seeking the presidency. Clinton spokesman Nick Merrill also told CNN that the former secretary of state will do more in Iowa than just attend the steak fry. "She’s looking forward to campaigning for her Democratic friends and colleagues and to helping the effort to move America forward, including a stop to see her old friend and colleague Senator Harkin to help raise money for important races in Iowa," Merrill said in a statement. In addition, a DCCC source tells CNN that Clinton will fundraiser for the congressional campaign committee, including a women's event in San Francisco with Leader Nancy Pelosi. "We’re thrilled and grateful that she is lending her support to our shared goal of electing a Democratic House of Representatives that will put a stop to the endless cycle of dysfunction and shutdowns from this Republican Congress," Chairman Steve Israel said in a statement. 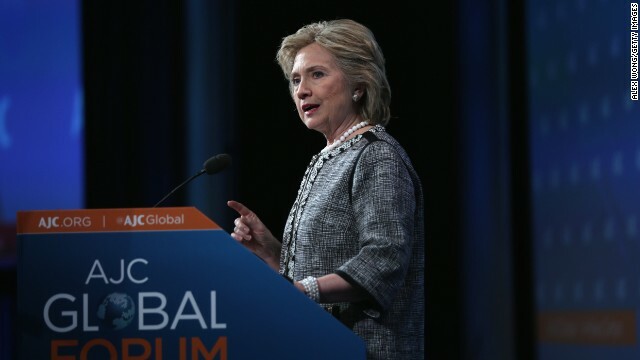 Since leaving the State Department in 2013, Clinton has largely tried to stay out of politics. Other than campaigning for candidates with whom she has a personal relationship – including Virginia Gov. Terry McAuliffe and her daughters mother-in-law – Clinton hasn't done any political fundraising. But as likelihood of Clinton running for president in 2016 rises, political committees and groups have stepped started to ask Clinton for help in the 2014 midterms. In April, while at an American Jewish Committee forum, Israel spoke with Clinton about what she is willing to do around the midterms. According to Israel, Clinton said, " I want to help," to which Israel said, "Not the minute, but the second you are ready to help, you let me know." Democrats have an uphill climb to taking back the House, and recent polling show the fight to keep Democratic control of the Senate will be close. In an interview with CNN, Israel said he saw Clinton as able to go into a number of different states, but especially Illinois, California, New York, Florida, Pennsylvania and Arkansas. "Her appeal is so broad. She excites our base. There are few people stronger than she is with swing voters," Israel said, listing Clinton attributes as a fundraiser and endorser. It was widely assumed that Clinton would campaign for Democrats in 2014. The cadre of groups organizing around her possible 2016 bid – particularly Ready for Hillary – have tried to help midterm Democrats, and Priorities USA – a super PAC supporting her 2016 run – has told donors to focus on the midterms for now. In July, Clinton told a Southern California public radio station that she is "committed" to helping midterms Democrats. "I strongly am committed to doing what I can to keep the Senate in Democratic hands," she said. @DM4O- All the eyewitnesses if Ferguson accounts are not the same and the autopsy proves some of their accounts were wrong. @Ladies-Also, a 2009 Army investigation found that Bergdahl went AWOL. Yeah, so? AWOL just means he left his post without permission. That could also mean someone who is AWOL was kidnapped or is missing for other reasons. You claim to have served in the military, so how do you not know that? If the Army had upgraded their 2009 findings from AWOL to desertion after he was missing for more than 30 days, your comment might have merit (and if wishes were horses, beggars would ride). When my husband was in the military a kid went missing and was classified as AWOL. Turns out he went scuba diving by himself and had a medical episode that led to his death in the water. He was classified AWOL until they found . No kidding. Even using Teatroll math, Obama is half white, so that’s 50% of a person, and half black, which means P% x 3/5 of a person in the Teatroll mind, so that’s another 30%. So basically, Teatrolls think Obama is just 80% of a person. That would mean, even if we accept Teatroll world view, just sayin’ would have to be 20% of a person to be even 1/4 of the person Obama is, but sadly he isn’t. He’s a parrot squawkin whatever words he’s taught by Faux and Breitbart and the Daily Caller and Red State and the rest of the RWNJ agitprop machine. Truth be told, what lie did I tell? You spent an entire day quoting the comments Brown's friend made about the shooting in Ferguson. Those are all lies. He hasn't uttered a word to the press for several days. His attorney has been making statements on his behalf. Are you telling us that you do not understand how the system works? What a lawyer may say on behalf of his client is not the same as the client saying it. You spent an entire day manufacturing arguments based upon remarks no one had made, except for you. I've notice that you Wellington J. Wiggouts have defense reflex when you've cornered yourselves. Lie. Call people liars. Actually the autopsy shows that Mike Browns hands were in the air and that at least 2 bullets hit him from behind. Those were the words from Bader this morning on our local Fox 2 News. Sounds like the witnesses were right. Who cares about Hillary Clinton? She isn't running at her advanced age and given her diminishing mental capacities. Democrats are going to be up the creek without a dinosaur when she doesn't run. Then again, there is always Gaff-O-Matic Biden. @Malory-Bergdahl was seen leaving the base by himself, he was seen in an Afghan Village by himmself, and the Taliban have said when he was captured he was by himself away from the base. The investigation found he left his base on his own freewill. Btw, I`ve said he went AWOL not deserted, so why your bringing that up I have no idea. Obama is never going to let Bergdahl get tried for his desertion and treason. Can you imagine that headline? "Obama swaps FIVE Taliban Leaders for an American Deserter & Traitor"??? Juts like they have completely buried the Ft. Hood terrorist attack as 'workplace violence'. There has not yet been an official investigation completed into Bergdahl's disappearance from the Afghan base. They're just now beginning to question him. The only complete investigation into the matter was conducted by Fox. geez, why are you continuing to lie about this?! an autopsy cannot and would never state the positions of somebodies arms when they were shot. that is impossible to determine and bader would never ever say that. and the autopsy diagram posted on this very site yesterday showed no, repeat no wounds in the back. you are lying just like the witnesses lied in order to smear the police. Actually he did. I saw it this morning. And I'll take his word over a nobody like yourself. You're the one that posts lie after lie. @Rudy-False, in 2009 there was an Army investigation that found Bergdahl was AWOL. It was released by the Pentagon shortly after the swap. You're conflating two separate investigations, smith, and drawing false conclusions about the current investigation that is only just beginning. What difference does Bergdahl make anyway, smith? What's your point? Do you even have one? Are the straws that far out of reach? You're way out off topic, on a subject of your own manufacture. One that you think you can win. You know, our mutual friend 'tom l" likes to do the *exact* same thing. He, too, likes to manufacture debates by framing the other sides point of view for them ahead of time. You mean like when the FPD posted a video supposedly showing their victim in a robbery? Or that they released that he may have had Marijuana in his system? The FPD is trying to harm their victim's reputation- nothing more nothing less. But here's a question- does anything the FPD has released given them clear right to kill someone? I think not. Meanwhile in today's news- you can find stories supporting exactly what was written above- the victim likely had his hands up at the time he was shot. Therefore, for all involved and as this is a rapidly evolving story, I'd refrain from taking one side or another's cause, and stick with facts. Hell yes an autopsy can determine where somebody's arms were when they were shot. Angles, trajectory of the bullet, entry points, height of victim, position of shooter all of these things combined with an autopsy can determine the position the person was in when shot. They can also tell when the fatal shot was fired, from where, and, if they have gun, who fired it. @Rudy-The point is the Bergdahl case and the Brown case are two totally different cases and facts of the cases are different. Bergdahl`s case more than likely will be a non-judicial case. So to say Im using a double standard by making an opinion with over ten eyewitness saying the same thing and an investigation that concluded the same thing to a case with different accounts which my opinion is to let more facts come out is beyond dumb and a facile argument. @Tom l-I come to expect the calling out since I`ve called out so many for using double standards. However, some of these peeps remind me of a poor marksman that keeps firing but has failed to hit the target. I seem to always have to show my comments logic and or merit of my opinion. You can say the nastiest things you want about him but he's POTUS. And he will be until January 2017. And guess what? No matter how hard you try. You'll never be 1/4 the person or man that he is. So keep spewing lies and hatred. While the rest of us live our lives hate free. And the truth wil set you free!!! I love your comment you have blessed America's King (my King), he carries himself like royalty because he is royalty no republitards will ever be as great a President as he is.